Adventures With Nomad: There Is No Place Like This...! 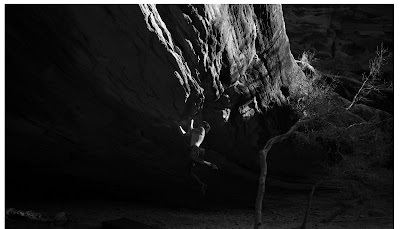 Photo by Damon Johnston © 2008: Climber on new project just outside Moab, UT. UPDATE: 3-26-08: OK, it is just outside of Moab, off the Potash Rd, just a few miles past the climbs. Corona Arch Trail, just a few minutes up the trail (stay in the drainage). Dean Potter sent this problem some time ago and the word is out. Which is why I have changed the above photo and replaced the "Sorry, someplace near Moab, UT" with this new update. This area offers many high-ball problems that will keep your attention for days, weeks or months. Bring a lot of pads and friends to spot you!!! !